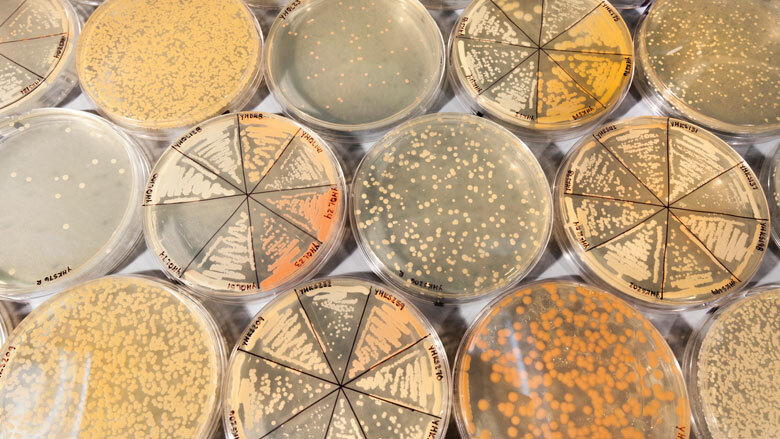 Petri dishes in the Hittinger lab at UW–Madison grow a multitude of wild yeast species. Undiscovered yeast species and engineered yeast hybrids may hold the key to unlocking the biofuel potential of switchgrass and other biomass crops. Photo by Sevie Kenyon/UW–Madison CALS. Yeasts are single-celled organisms whose voracious appetite for sugar serves us well. For over ten thousand years, humans have harnessed the fermentative power of yeast to create beer, wine, cheese, and bread. But yeasts are also critical to the process of generating other important products, including medicines such as penicillin and biofuels such as ethanol. Genetically closer to animals than plants, yeasts are living microorganisms that feed on sugar. When yeasts metabolize sugar, they convert it into other compounds. In the case of biofuels, yeasts convert the simple sugars found in plant biomass into ethanol, isobutanol, or other specialty fuels. The efficiency with which a yeast species converts sugar affects the yield of any fermented food or fuel product. As such, yeast performance can be the deciding factor in whether or not a particular product is economically viable. Corn-based ethanol, which is developed by combining a high-efficiency yeast with sugar-rich corn, is one example of a popular product that offers a high return on investment (though, corn production is also heavily subsidized by the U.S. government). Currently, as much as 97% of gasoline sold in the U.S. contains ethanol. Producing economically viable biofuels from biomass other than corn, however, is more complicated. Many biofuels researchers, including those at the Great Lakes Bioenergy Research Center (GLBRC) based at the University of Wisconsin–Madison, are now focused on making biofuels from low-input crops such as switchgrass and poplar. These dedicated bioenergy crops, no portion of which are used for food, avoid the conflicts that arise from growing food crops to produce fuel. Although not yet a market force, cellulosic biofuels, or fuels made from grasses and wood, are routinely factored into future climate mitigation scenarios because of their potential to displace petroleum use and mitigate greenhouse gas emissions. Dedicated bioenergy crops can also be grown on non-agricultural land, require less fertilizer than annual crops such as corn, and boost biodiversity. Ultimately, GLBRC researchers hope to find ways of growing sustainable biomass and converting it to biofuels and bio-products that provide cost-competitive alternatives to petroleum-derived fuels and chemicals. Getting there, however, will depend on a number of scientific advancements, including finding new ways to harness the power and potential of yeast. The idea of improving yeast function for industrial purposes is not new. Researchers around the world have engineered yeast strains to increase the efficiency with which they ferment, and the fermented food and biofuel industries all rely on such improved strains. But approaches to this efficiency challenge are also multiplying and growing in sophistication. While the number of known yeast species currently lands somewhere above one thousand, the food and biofuel industries have historically relied on only a handful. What drives the research of Chris Todd Hittinger, UW–Madison professor of genetics and GLBRC yeast expert, is a tantalizing sense of the untapped potential of the rich variations in yeast species created over hundreds of millions of years. Diversifying the strains of yeast we use could mean new and different “brews,” including brand new flavors for food and faster, more efficient processes for making biofuels. In addition to locating and studying wild species of yeast, Hittinger and his team are exploring the potential of crossing two different yeast species to produce hybrids with new and useful characteristics. In previous research, Hittinger discovered that hybridized yeast played a significant role in the success of beer brewing. Around five hundred years ago, the yeast Saccharomyces cerevisae accidentally crossed with Saccharomyces eubayanus. The emerging hybrid had the newfound ability to ferment in cold temperatures, which meant it could thrive in European caves and cellars. This discovery caused Hittinger to wonder if similar hybridizations couldn’t find application in both the food and biofuels industries, or if other “industrial advantages might be gained from similarly adding genes from a very different yeast species.” Since hybridizations such as the one giving rise to lager beer have only a one in a billion chance of happening in nature, Hittinger needed to develop his own means of encouraging hybridization between two genetically different yeasts. With funding from Great Lakes Bioenergy Research Center and the National Science Foundation, Hittinger came up with a quick and efficient way to express the naturally occurring yeast proteins that enable reproduction and to coax two yeasts to reproduce. “Within a week, you can generate a large number of hybrids of whatever two species you want, creating forms never seen before,” says Hittinger. Not surprisingly, Hittinger’s hybridization process gained the interest of Wisconsin beer brewers. Fermentation science graduate student Kara Hulce, working with food science professor James Steele, began brewing with the yeast hybrids in UW–Madison’s fermentation lab back in 2016. A certified beer judge and expert in fermentation, Hulce ferments her beer in a pilot lab donated by Miller Coors using the same product development scale that industrial brewers use. She monitors small fermentations of hybrids and parental strains of yeast at two different temperatures (lager temperature of 100 degrees Celsius and ale temperature of 200 degrees), looking for useful characteristics and possible industry applications. Currently, she is working with four of Hittinger’s new hybrids in the lab, one of which contains a strain of Saccharomyces eubayanus discovered in the soils of Sheboygan. “I try to see how these strains could work in a brewing setting,” Hulce says, “how quickly the yeast will come out of a solution, how it uptakes sugars, and then—a big thing—flavor.” As for taste, Hulce says that so far the early brews are spicier than you’d expect from a classic lager strain. Hulce’s research could help accelerate the rate at which Hittinger’s technique results in new commercial products, but it’s also a good example of the way in which a single university technology can potentially have an impact on multiple industries. Indeed, Hittinger’s hybrid yeasts are bringing researchers closer to cracking the code of cellulosic biofuels. A study published in early 2017 details how Hittinger and his team created vigorous yeast hybrids that exhibited improvements in stress tolerance, sugar consumption, and biofuel yield—all traits of interest to the biofuels industry. To find the right combination of traits, the team first studied a diverse collection of wild yeast strains and then tested them to see which ones grew the best under conditions used for making biofuels. Once they had identified the top four strains, they crossed each of the wild strains with two industrial strains of engineered Saccharomyces cerevisae. To determine whether the newly generated hybrids could be improved by an accelerated version of natural selection called “adaptive evolution,” the scientists then exposed six hearty hybrids to harsh industrial conditions, requiring them to retain tolerance to toxins and ethanol, and forcing them toward starvation if they did not consume xylose, a difficult-to-ferment plant sugar. The hybrids grew, multiplied, and, most importantly, mutated, a sign they were not just surviving but also adapting to their harsh conditions. Hittinger’s team now believes that by combining hybridization and adaptive evolution, they can zero in on the genetic code associated with desired traits.